Home Directories	Top 10 Reasons to Enjoy Summer Camps at Charlotte Christian, and a CAMP GIVEAWAY too! Top 10 Reasons to Enjoy Summer Camps at Charlotte Christian, and a CAMP GIVEAWAY too! With the long weeks of summer quickly approaching, now is the time to make plans to keep your children engaged, active, and learning, but most of all it’s a great time to plan lots of summer fun! And guess what, we have yet another Smarty Camp Giveaway – woot, woot! Charlotte Christian School has offered a wide array of academic, athletic, and enrichment camps at an affordable price for more than 10 years. Camps are conveniently located on the school’s south Charlotte campus on Sardis Road with nearly every camp under the direction of Charlotte Christian’s own faculty. All camps are open to the public and students in all grades are welcome. 1. Get moving and try a new sport – Christian offers a variety of athletic camps for all skill levels including soccer, karate, basketball, lacrosse, tennis and cheerleading. Charlotte Christian’s state championship winning coaches also host baseball and football camps for kids as young as junior kindergarten who are anxious to learn the games. 2. Stay on top of school – Academic camps are a great way to review subjects and get a jump start on the next grade level. Charlotte Christian’s faculty make learning fun with math, reading, and writing camps featuring explorations with Singapore Math, Dr. Seuss and C.S. Lewis. 3. Meet some new friends! Campers will spend a week developing new friendships and staying connected. The wide array of camps caters to a variety of interests and grade levels so there is something for everyone. Camps are open to the public so it’s a wonderful way to make a new friend! 4. Get in touch with your creative side – Aspiring artists can spend the week exploring clay and pottery or learning about the classical masters of art and practicing their techniques. Campers can also get crafty in the kitchen and eat their edible art at the week-long Cupcake Camp or Cake Pop Camp…Yum! 5. Stay Tech Savvy with STEM – Charlotte Christian is offering two new STEMAPALOOZA education camps centered on technology, engineering, and computer programming. Campers will learn an iPad programming language, use LEGO WeDo Robotics, build motorized mechanisms for working machines, and much more. STEMAPALOOZA is offered for both girls and boys for a really cool and “techy” summer! 6. Not too old to have fun! – Charlotte Christian offers a wide range of camps including campers just starting junior kindergarten on up to rising seniors. Opportunities await campers in everything from football and running to CSI and movie making. It’s a great way to keep students of all ages engaged and learning over the summer. 7. Old favorites – Charlotte Christian has some familiar favorites that have been offered each summer for many years. Some popular camps include American Girl Doll Camp, Cupcake Camp, Super Summer Day Camp, LEGO Maniacs, Club Penguin and more. Come see why campers come back each year for these fun and exciting experiences. 8. Lights, Camera, Action! – With a total of five different camps focused on the art of movie making and film production, campers of multiple grades and skill levels will have the chance to learn how to write, produce, film, star in, and edit their own films using a variety of programs like iMovie Maker, Adobe Premiere, and Final Cut. Students will shine on both sides of the camera for a star-studded summer! 9. A Time to Serve – Campers will enjoy the opportunity to go out into the city of Charlotte to give back to their own community by serving in homeless shelters, working with those less fortunate, and embracing a love of service to others at multiple locations throughout the city. This is a week that will impact the campers as much as it impacts the community they will serve. 10. Stay Cool and Learn Something New – When the summer heats up, it’s always good to have a little time to cool off. Campers can enjoy indoor camps that peak their interests like Minecraft Masters, Board Games, CSI Science, Piano, Voice, Girls Just Wanna Have Fun Camp, and much more! 1) Click here to take a brief survey to register to win. 2) Like and share this post on facebook and like Charlotte Christian on facebook. 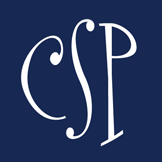 3) You MUST be a CSP e-newsletter subscriber. 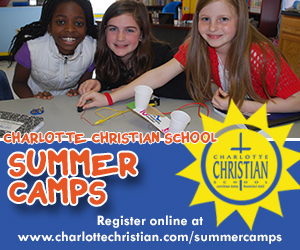 4) Leave a comment below with which Charlotte Christian camp your child would want! We’ll pick our lucky Smarty camper on Friday, 4/25/14! Visit www.charlottechristian.com/summercamps to view a complete listing of camp offerings at Charlotte Christian School or contact or Mrs. Christy Coles, our camp director, at christy.coles@charchrist.com. Update on Jen Pagani: Scans are good! My daughter would definitely love yo attend the Lights Camera Action day camp. She aspires to be a writer and producer. My son would most like to attend the Stay Tech Savvy camp to foster his inquisitive nature. Stay cool and learn something new is my son’s pick! So hopeful!! My son would love the LEGO MANIACS CAMP! What a great contest!! My daughter would love to do the iMovie camp! My son would love a sports camp! There are so many camps my kids would enjoy…film making & the LEGO camps top the list! I also love the sound of the STEM camps! My daughter would love stemapalooza for girls! My son would love any sport camp but football would be his top choice! My daughter would love Girls just want to have fun! There are so many great ones to choose from, but I know my daughter would love either Pottery Formations Art Camp or STEMapalooza for Girls. Would love any of the indoor camps, especially when it gets so hot out in the summertime. My daughter would like stay on top of school! This does not surprise me because she LOVES to read. STEM sounds great…son might choose sports though! Great giveaway. Thank you. My 7 year old would love STEM camp or the Cake Pops cooking camp! My son would love CAMP COMMUNICATE and my daughter would love CSI or MATH MANIA! My daughter would LOVE to do the STEM or Lego camps (or maybe both)! My son could definitely use the “Stay on Top of School” I would love to give him the extra practice since he is learning to read and Kindergarten is more like 1st grade now adays….It’s been a challenge:)! !